WOW, doTerra's annual convention last month was incredible! It was a fabulous week and I was lucky to meet some of you for the first time. When you work alongside people you love and care about and we all raise each other up, it's no longer a "job" but a lifestyle of sharing your passion for natural health. Working with friends like you across the globe and sharing natural health is the best career choice I have ever made! doTerra has created 2,000 local jobs and created over 19,000 fair wage paying jobs for farmers and oil distillers in developing countries. We have lifted up and improved entire communities and economies that had been neglected. Our company's Healing Hands Nonprofit Foundation has raised over $3 million to build schools, fund health clinics and women's centers, and install wells and infrastructure this year as well as help stop trafficking of children here in the USA and around the world by working with Underground Railroad. doTerra does not turn a blind eye to difficult subjects, but rather figures out a way to help in any situation. Grateful doesn't even begin to describe how blessed I feel to be part of the mission to bring the highest quality essential oils on the planet into people's lives and homes. doTerra is not only the best and most ethical essential oil company ever, but with its outreach to those in need, it is also so much more. So...what else came out from convention and is available in October?! 2. 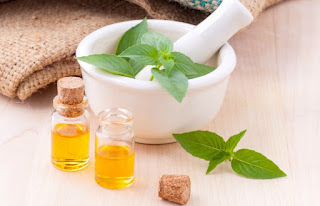 Spikenard Essential Oil 5ml | Good for just about EVERYTHING! 3. Serenity Restful Complex | Supplement for Sleep. With L-Theanine, Passionflower, Lemon Balm and German Chamomile. I tried this last night....BEST SLEEP I'VE HAD IN A LONG TIME! 5. Hope Blend | Exclusive Blend for Convention Attendees but available in the Post Convention Tour Kit! 14. PB Assist Jr | Kids’ Probiotic Sachets, Sugar Free, Dye Free, Encapsulated, Tastes Like Pixie Sticks! My kids LOVE THEM! We also have NEW enrollment kits now available! 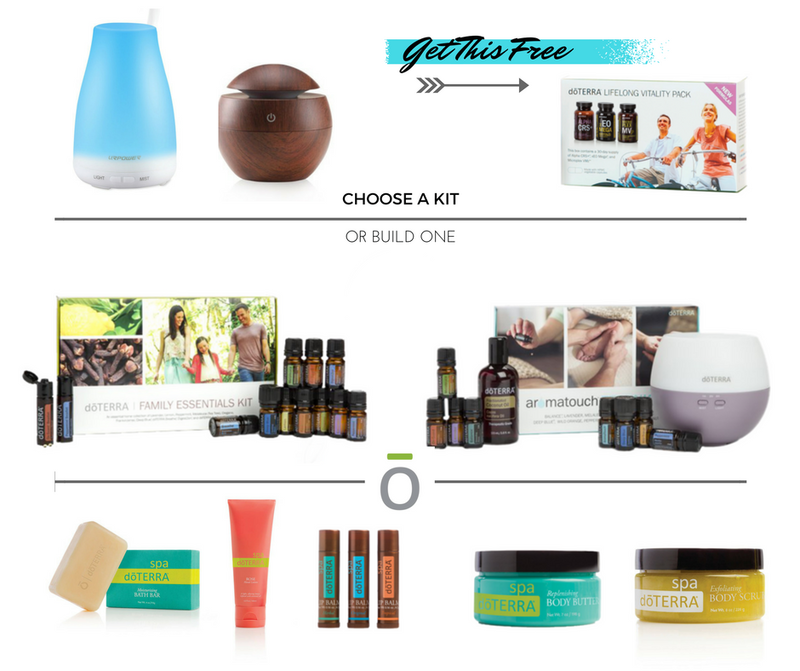 We now have 2 starter enrollment kit options at 100/110 PV and 2 kit options at 225 PV. By popular demand...we now have a diffuser in a basic starter kit. YAY! Get the AromaTouch Diffused Kit with a Petal Diffuser in it automatically. Also, we now have a new Family and Kid Wellness Enrollment Kit geared toward improving children's health and parents too. The Natural Solutions Kit has been improved (saves people even more money) and we have a NEW Oil Sharing Kit among others! Motivate Blend is 10% off this month. I apply this blend topically to my aromatherapy bracelet every day. Motivate and Peace blends are always with me in the car as well so that I can tackle whatever driving throws my way. A great way to save money this month is with the Post Convention Tour Kit--Available now in your back office. Please note that you cannot save this in your LRP order for a future date. You need to add it to your cart and then you will only have the SHIP NOW option available. 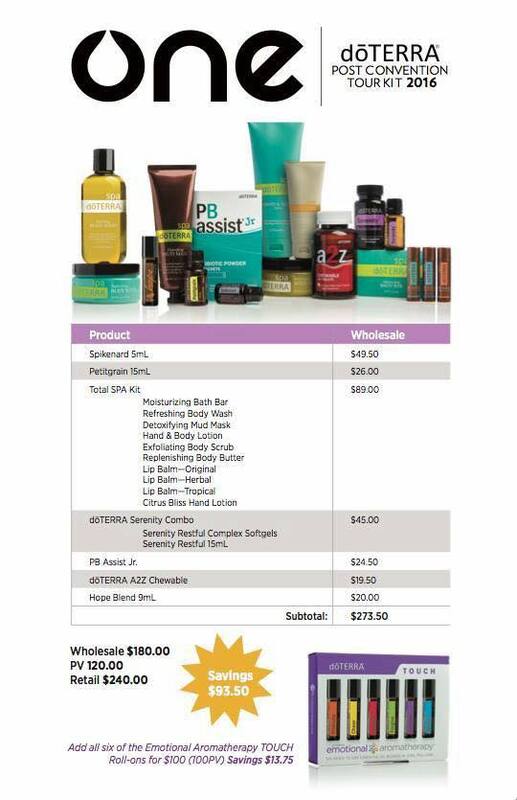 Save $93.50 when purchasing these amazing new products together: Spikenard 5mL, Petitgrain 15mL, Moisturizing Bath Bar, Refreshing Body Wash, Detoxifying Mud Mask, Hand & Body Lotion, Exfoliating Body Scrub, Replenishing Body Butter, Lip Balms – Original, Herbal and Tropical, Citrus Bliss Hand Lotion, Serenity Restful Complex Softgels, Serenity Restful 15mL (new formula), PB Assist Jr, A2Z Chewable (new formula) and the exclusive Hope Blend 9mL. You can add this kit as part of your LRP order this month as long you process the LRP order at the time of adding it to your cart. 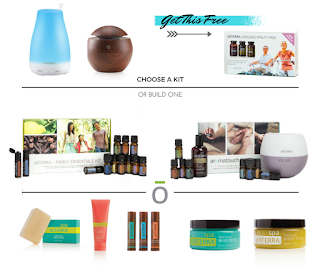 Interested in getting started with doTerra? This would be a great option as well along with the Introductory Enrollment Packet for a wholesale account. Our doTERRA oils are second to NO OTHERS in the world. Bottom line is they work! For anybody out there who thinks essential oils are hocus pocus, hang tight, because the science is coming! It was awesome to hear from a panel of doctors on a stage in front of 30,000 people who are sometimes mocked by their peers but know that essential oils work. One of them said, "Our system is broken and I was looking for a solution" and found that solution in essential oils. I'm proud to be a part of a company who is literally changing the world! I love that I am part of this Revolution to Natural Solutions!! Changing the world, one drop at a time!! Check out all the places the Post Convention tour is coming both in the USA and Canada as well as some offered in Spanish. This is an amazing time to learn more about our company, the new oils and products and buy a special kit as well. Everyone is welcome. Find a date and place near you this season! Wishing you a beautiful month! Sometimes you have seasonal allergies and the best way to get rid of them is by using natural alternative like essential oils.